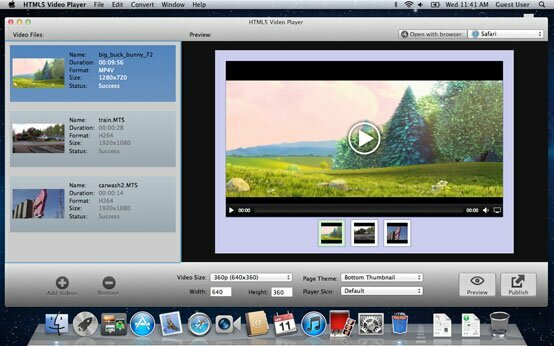 Encode Any Videos to HTML5 video! HTML 5 Video Player is an easy html5 video encoding software that can encode HTML5 video and generate the HTML5 code for embedding HTML5 video galleries into your websites in easy steps. Many video encoders and converters can convert your videos to WebM, MP4 or OGG that are compatible with HTML5 browsers. However few of these HTML5 video encoders are able to convert videos into different HTML5 video formats simultaneously. Most of the HTML5 video encoders can only output one single HTML5 video copy at a time. That’s to say, if you like to convert a video clip to WebM, MP4 and OGG formats, you will need to repeat the video conversion process three times. It is disturbing, isn't it? Don't worry, we will recommend an easier HTML5 video encoding solution bellow. How to Encode HTML5 Video with HTML 5 Video Player? You can simply drag and drop your source videos to the HTML5 video encoder & player. Or you can go to the Edit menu >> Add Videos to browse through your video albums on your computer and select to add them to the HTML5 video software. At this steps you can specify the video gallery template, customize player and/or video size/style, etc. Once you are ready with tuning the video player, click the Publish button to finalize the html5 video encoding and generate your HTML 5 video gallery. It will be saved in the Output Folder of the video tool on your hard disk. Go to the HTML5 menu, then choose Open Output Folder from the drop-down menu list. Now you are ready to publish your HTML5 video to your websites, download the powerful HTML5 video encoder bellow.